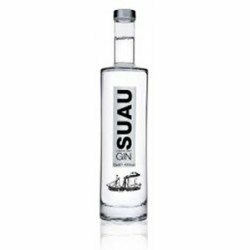 Suau Gin, the first 'premium' gin of Mallorca. Available box with 4 bottles. ‘Suau Gin’, the island's first premium gin. It is produced in four distillations from Mallorcan ingredients: oranges, lemons and almonds are blended with juniper berries, coriander, angelica from Saxony and Belgium, and orris and liquorice root. The juniper alcohol is imported from England, to give it the denomination "London Dry Gin". It is a traditional gin, made using the same, top secret recipe followed at Bodegas Suau for the past 40 years.